Sony BDP-S363 review | What Hi-Fi? 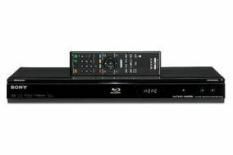 Put the 'S363 Blu-ray player next to Sony's current budget king, the BDP-S360, and you'll be pushed to find any differences. There are none. This Sony Centre exclusive is identical in every way except the remote control. The new model comes with a backlit wand, although it still remains a mystery as to why Sony can't find space for an eject button. We always get a bit nervous when a manufacturer claims that a new model is supposed to be identical to a current favourite. What happens if we find that the performance doesn't match? Thankfully, there's no need to fret. We're pleased to report that the 'S363 is every bit as good as the 'S360. Images fed through the HDMI output look punchy and entertaining. Spin the Blu-ray of Star Trek and, during the scene where Kirk and Sulu attempt to sabotage the Romulan drill platform, the Sony handles the action with great confidence. The detail levels on the platform are superb, the colours of the actors' faces just right, the edge definition razor sharp. There's also great speed and insight to the player's sound that mimics that of its identical twin.